Taking a look at Heath Ledgers chart (4-4-1979, Perth, Australia, no birthtime available, using Vedic Moon-rising Chandra lagna chart) there is a strong Piscean accentuation, which is clearly an advantage for an actor who must embody the appearances of various characters, but also their more invisible aspects. Ledger was known for his dedication to his craft. The Pisces accentuation (more than three planets) would also corroborate a potential weakness for drugs or forming codependent behaviors with substances. Pisceans can have a regressive tendency for escapist dissipation and self-pity. Ledger lately was saying that he was getting no more that two hours sleep a night, even with sleeping pills. He was known as a partier on the New York scene. At this time Ledger was also undergoing his first Saturn return. Obviously he was going through an important time in his life with all its attendant stresses on his psyche. He had just broken up with his daughter’s mother, and he was on the verge of greater success in his life. So there was a lot going on, and he was at a very critical time of his life. The reasons we are taken out of life can be varied. Sometimes we burn the candle at both ends. Other times death is life’s giving us an escape from increasingly bad situations. Sometimes we are unjustly cut down my malevolent forces. Sometimes the thread runs out, as it were, and we’re fated to have a short life….only to live on in some sort of a legendary manner like James Dean, Marilyn Monroe, or Princess Diana. In a Rolling Stone magazine review, Peter Travers wrote about Ledger’s portrayal of the gay cowboy in Brokeback Mountain: "Ledger’s magnificent performance is an acting miracle. He seems to tear it from his insides. Ledger doesn’t just know how Ennis moves, speaks and listens; he knows how he breathes. To see him inhale the scent of a shirt hanging in Jack’s closet is to take measure of the pain of love lost." 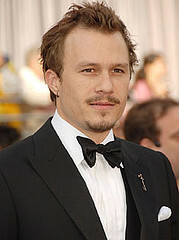 Ledger received "Best Actor of 2005" awards for Brokeback Mountain from both the New York Film Critics Circle and the San Francisco Film Critics Circle. He was also nominated for the Academy Award for Best Actor for his performance. Having the Sun in Pisces in the tenth house is good for reputation, success, and renown; which was becoming for and more of a fact for him. Ledger seemed to have a certain success written in his stars. 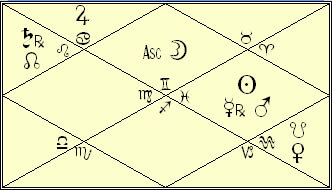 Looking closer at his chart, the ruler of his Gemini Moon, Mercury was strongly debilitated in his chart being conjunct two malefics, the Sun and Mars; and it was also debilitated by sign position. 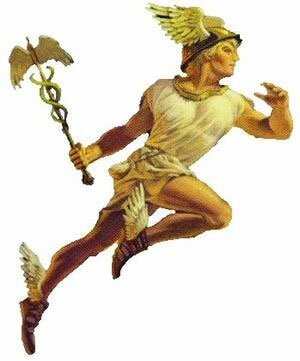 This states in astrological terms was that the element that represented his selfhood or mind, Mercury, the ruler of his Moon sign and ascendant, was disinclined to function normally, even if ever so slightly. And therefore he could have been vulnerable to negative states of mind, which could have brought him to less-than-optimal places. Ledger’s propensity to play characters of a more troubled or unusual nature could be shown from the opposition of his Sun to Pluto, and maybe explained some of the more obsessive drives in his life such as partying all night and not being able to sleep afterwards. It was difficult for him to “turn off”. 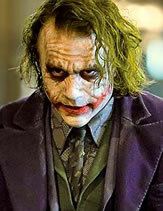 He had just concluding filming the part of the Joker in the upcoming “Batman, the Dark Knight” movie. The director Chris Nolan praised Ledgers performance, bringing out the deepest of psychological demons through the part. Perhaps Ledger walked the edge just a little too much. The soul casts off its shell when it no longer serves its purpose. Maybe the complex Piscean character that was Heath Ledger could no longer abide with the trappings of fame and stardom, he had to retreat to a universal bosom to try again. In videos of interviews he had a very obvious uncomfortability being in the limelight except when he was in character. He leaves behind a daughter and her mother, but maybe the seeming loss only serves to bond people in a different way.